New Map Ping feature allows for more organised attacks. Stardock has launched an extensive update for its latest space-flung RTS Ashes of the Singularity. Update v1.3 welcomes five new maps, a host of features focused on unit responsiveness and movement, and a new Map Ping feature which makes grouping together prior to big assaults easier by way of marker placement on the mini-map. 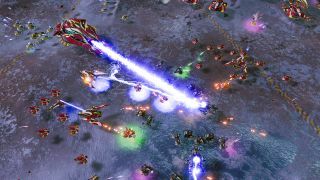 Prior to its release, Ashes of the Singularity was billed as real-time strategy on “an unprecedented scale” and, while it did look the part, its lack of variety in its maps and campaign narrative proved an issue for Leif when he took it for a spin back in April. The latest update looks to tackle at least one of these issues with the introduction of five new maps—each of which brings with it its own set of objectives. Maurn, for example, is a compact two-player map where players must choose between taking an enemy base head-on, or by gunning “for the victory point around their flanks”. Pulaski, on the other hand, is a medium sized four-player arena, where players are tasked with gathering resources within winding canyons, all the while staving off enemy attacks. Update v1.3 also improves unit responsiveness as squads now react faster to move orders and reach their destinations more efficiently. Both acceleration and banking speed have been tweaked to give players better control of their armies which, alongside upgraded movement, means larger units no longer inadvertently gather together in groups. Full patch notes for Ashes of the Singularity’s update v1.3 can be found over here, which include a list of bug fixes and balance tweaks beyond the new maps and features noted above.